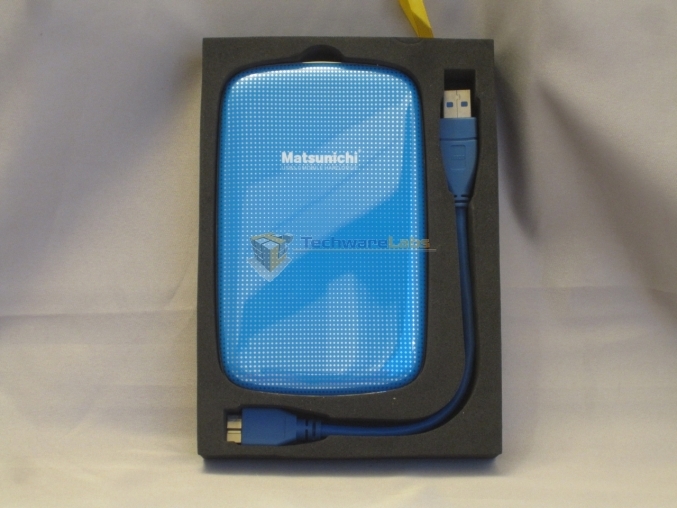 Matsunichi is one of those Chinese electronics firms that is simultaneously everywhere and nowhere. Everywhere, in that you can find their stuff on Amazon, in Best Buy, and even Wal-Mart; nowhere in that hardly anybody outside the industry recognizes their name. They focus mainly on tablets, media streamers and portable hard drives, and it’s this last group we’ll be taking a look at today. 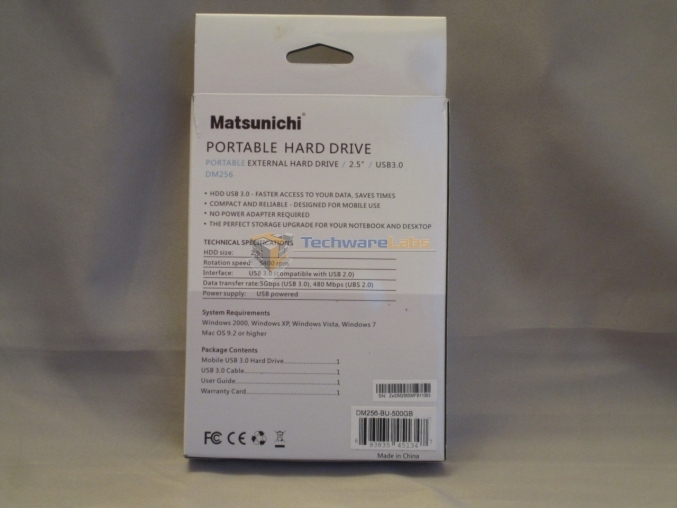 Their 500GB USB 3.0 hard drive offering, model number DM256-BU-500GB, aims to give you half a terabyte for half a benjamin with minimal fuss. A cursory examination of the major online retailers confirms that they hit their price point, but what sort of performance do you get for your money? Let’s put this drive through its paces and find out. Here’s what will greet you if you run across this drive on the shelves of your local big-box retailer. 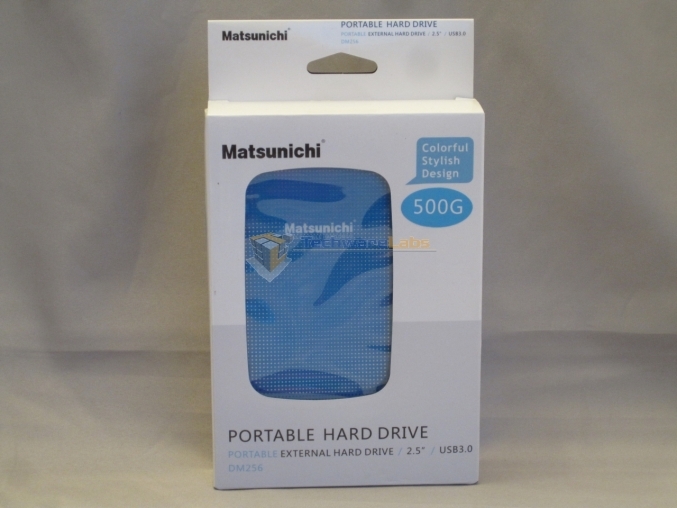 The packaging is minimalist and to-the-point: here’s a drive, it holds 500GB, it’s USB 3.0, and hey, it’s blue! Flip it over, and we get more info: it’s a laptop drive, it’s bus-powered, and it does USB 3.0 speeds. The claim of 5Gbps relates solely to the USB 3.0 bus; no hard drive on Earth will give you that kind of throughput, let alone a cheap 5400 RPM laptop drive. Pulling the drive out of its box produced the first pleasant surprise: it’s enclosed in some rather dense closed-cell foam. This drive isn’t going to shift around in transit, and it’s also going to be fairly well protected against bumps and shocks. Also readily apparent was the high-gloss finish of the enclosure, which is mostly plastic. Looking at it edge on, you can see the USB 3.0 micro-B plug and the power/activity LED. This is literally all there is to see of the drive, aside from the candy-coated shell. The strip around the edge is more plastic, though with a nice looking chrome effect.